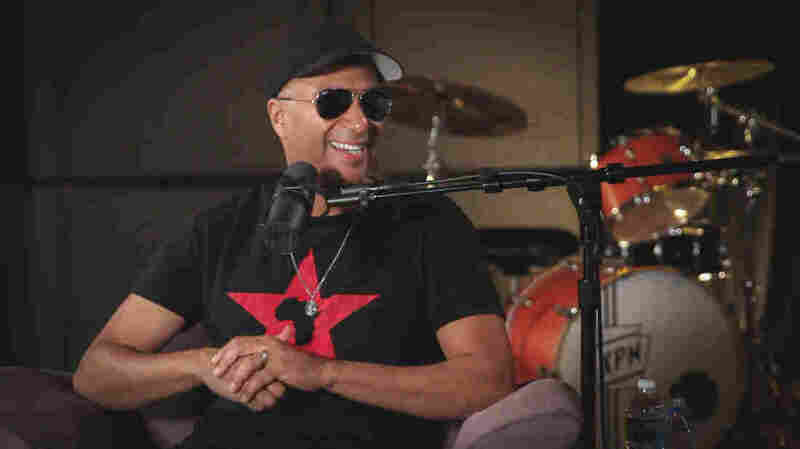 Tom Morello On World Cafe : World Cafe The guitar legend talks Bruce Springsteen, Chris Cornell and his new sound on his latest album, The Atlas Underground. Tom Morello inside the World Cafe Performance Studio. "Where It's At Ain't What It Is"
"Every Step That I Take"
Morello is a rock legend. He changed the shape of music with his guitar playing in the rap-rock pioneering band Rage Against the Machine, whose political stance was only made more visceral by the sound the band created. And what a sound! Rage's liner notes famously read: "All sounds made by guitar, bass, drums and vocals." I used to think it's because they were anti-digital, but it wasn't. It was bragging. How could you make the sounds he did with just a guitar? Turning your guitar into a turntable is just one way Morello pioneered playing an Axe in the '90s, the same way Jimi Hendrix changed the sound of the instrument decades earlier. Hendrix is an apt comparison considering Morello wants to capture that spirit on his latest record, The Atlas Underground, taking his signature full Marshall stack fury, and marrying it with the sound of electronic dance music. Looking away from EDM, Morello's also played on stage with Bruce Springsteen In the interview, he talks about how many songs he had to learn to play with The Boss (If you think it's under 100, guess again! ), his memories of Chris Cornell and why Rage Against the Machine's music is more vital than ever. That and more in the player.